It was Harry Truman that said, “Not all readers are leaders, but all leaders are readers.” At Red Privet, we agree. Every month or so, we make like suburban soccer moms at a Starbucks and host a book club. Every Priveteer reads the book selection and then we come together to discuss key concepts and explore ways to apply what we learn to our work. 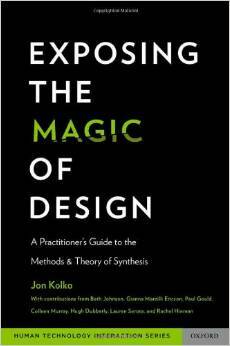 This month’s book, Exposing the Magic of Design: A Practitioner’s Guide to the Methods and Theory of Synthesis by Jon Kolko, reveals the magic of design synthesis, or that time in the project where the designer takes the research findings and data to create “cohesion and a sense of continuity.” In this book, you will learn the basics of synthesis, which are the foundation of the design synthesis methods. You will also learn the importance of design synthesis culture. The framework of synthesis is broken down into three tasks: prioritizing, judging and forging connections. The main reason why clients have a hard time understanding the importance of research is because the design synthesis process appears to be “magical.” Without concrete synthesis methods, synthesis is hard to describe to anyone, including other designers or even ourselves. Formalizing the process makes it easier to talk about, and easier to explain it’s importance to the client. It was therapeutic to read the author’s take on the importance of research and synthesis in the design process. Getting buy in is always difficult when it comes to research, and Kolko’s eloquent break down of why the client doesn’t get the importance of design research and synthesis left us feeling understood. The culture that design synthesis happens in is very important. The environment must encourage and enable the designer to open their brain to possibility and ideas. We, as designers, really connected to Kolko explaining the importance of humor and playfulness in fostering creativity and idea generation. The first half of the book is a summary of what design research synthesis is and why it is important, and is not really for practitioners. The second half of the book is a great resource for practitioners to keep around to reference when going through the analysis and synthesis process during a project.